Over the years there has been a lot of debate over what science can tell us about human origins and what role the Bible does or does not play. There are those who say that world was created exactly as described in Genesis 1. Others think that science has the answer and that the Bible is a unreliable. While these are important topics to discuss, the average person who is an expert in neither science nor the Bible can be left out. There has been a need for a good book to help the average person in the pew understand what the Bible has to say on the topic. 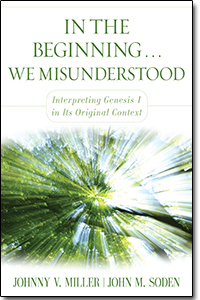 I was pleased to receive a complimentary copy of In the Beginning We Misunderstood:Interpreting Genesis 1 in It's original Context (Kregel, 2012) written by Johnny V. Miller and John M. Soden. The book is an examination of the creation story and how we interpret it. Here is the description. For years, the evangelical church and its members have debated whether the Bible should be interpreted literally or symbolically in regards to the age of the earth. In their groundbreaking new book, In the Beginning . . . We Misunderstood, authors Johnny V. Miller and John M. Soden say that all these arguments have missed the point. Rather, what Christians really need to know is how to interpret the Bible in its original context. I read the book this past weekend and found it to be quite accessible and informative. Miller and Soden's goal is not to promote promote nor refute Darwinism. Rather, they want to help readers understand the purpose of Genesis in its original context. While I might quibble with them over a point here or there I found the book to be well-written and a much needed contribution to the ongoing debate. What I like most about it is the pastoral approach that both Miller and Soden take as they tackle a difficult issue. And that is what makes this book valuable. While many books have been written on the topic, this is one for those in the pew who don't have a degree in theology or science. Since I think this book would be helpful for many in the church especially those in leadership looking for a good resource, I am going to give my copy away. Put your name in the comment section below and I will select a winner on Sunday, September 9th. I will post the winner's name on that day and you will have 5 days to claim your prize. Many thanks to Kregel Publications for the complementary copy! My friends at Zondervan asked me to pass on the news about a new conference that is being formed in southern California. 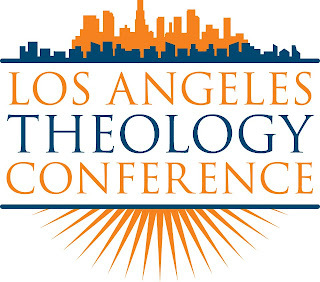 Grand Rapids, MI., September 6, 2012—Zondervan Academic has announced a new partnership with Biola University and Fuller Theological Seminary to launch the annual Los Angeles Theology Conference. The first conference will take place January 17-18, 2013 on the Biola University campus. The conference is entitled Christology, Ancient and Modern: Explorations in Constructive Theology and seeks to make a positive contribution to contemporary dogmatics in intentional engagement with the Christian tradition. Seminary. “It is our hope that through these meetings systematic theology may be invigorated and new conversations and dialogues across traditions and disciplinary boundaries begun.” Crisp’s idea found traction with the team at Zondervan Academic and Fred Sanders, PhD., Associate Professor of Systematic Theology at Biola University; together they began work on the conference in May 2012. The conference will feature a panel of accomplished plenary speakers who will survey the field and articulate the sources, norms, and criteria for constructive theological work. Speakers will include Oliver D. Crisp, George Hunsinger (Princeton Theological Seminary), Peter J. Leithart (New SaintAndrews College), Katherine Sonderegger (Virginia Theological Seminary) and Alan J. Torrance (University of Saint Andrews). Those with completed doctorate degrees in the field of systematic theology are invited to submit paper proposals on this year’s theme. Abstracts of no more than 200 words should be sent to LATheology@gmail.com before October 12, 2012. Registration will open on September 19, 2012 and an early bird registration rate will be available through October 31, 2012. 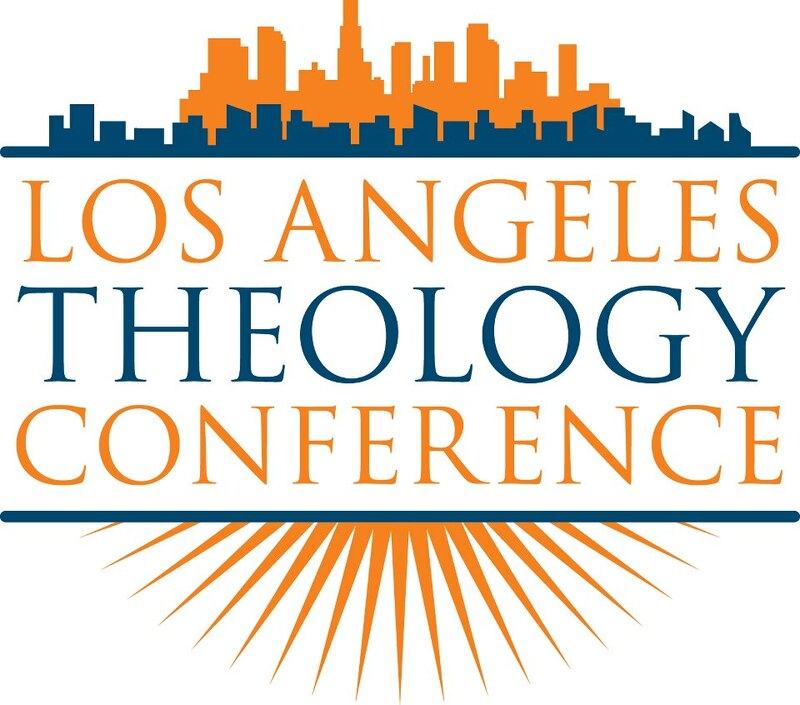 All potential exhibitors, attendees, or those wishing to submit papers can obtain more information by visiting LATheology.com. Craig Keener Explains Romans in 7 Minutes! Craig Keener is in a new Asbury video in which he explains Paul's letter to the Romans in 7 minutes. This is an amazing feat on two scores. First, I can't get through all of Romans in a ten week course. Second, I can't believe Craig was able to do this in 7 minutes. I mean, he is the guy who wrote a 1088 page commentary just on Acts 1 and 2. In any case, enjoy. If you visit Jerusalem you soon learn that the only source of fresh water is the tiny Gihon spring located at the extreme southeast corner of the city. In fact, its not even inside the walls that surround the Old City currently. Take a look at the size of the city during the time of, say, Hezekiah and you quickly realize that the Gihon can't produce enough water for everyone even if it did flow at a greater rate at one time. Add to this the fact that it only rains about six months of the year and the need for water becomes even greater. So what did the residence of ancient Israel do to supply the city with enough water? They dug cisterns to catch as much rain water as possible. With a significant population and a religious center that required water, cisterns were an important part of the infrastructure. Any tour of Jerusalem will/should include a a chance to visit Warren's shaft, Hezekiah's tunnel and the newly discovered Pool of Siloam. Today archaeologists are announcing the discovery of yet another ancient cistern in the city, and this is a big one. Take a look at the above picture to give you an idea of just how big it is. Here is what the press releases have had to say thus far. The recently discovered reservoir, with an approximate capacity of 250 cubic meters, is one of the largest water reservoirs ever discovered from the First Temple period. Due to its size, archaeologists believe the reservoir was designed for and used by the general public. According to Eli Shukron, the excavation director on behalf of the Israel Antiquities Authority, “the exposure of the current reservoir, as well as smaller cisterns that were revealed along the Tyropoeon Valley, unequivocally indicates that Jerusalem’s water consumption in the First Temple period was not solely based on the output of the Gihon Spring water works, but also on more available water resources such as the one we have just discovered." 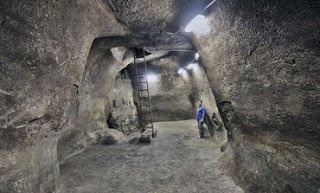 Dr. Tvika Tsuk, chief archaeologist of the Nature and Parks Authority and an expert on ancient water systems, presumed that “the large water reservoir, which is situated near the Temple Mount, was used for the everyday activities of the Temple Mount itself and also by the pilgrims who went up to the Temple and required water for bathing and drinking." 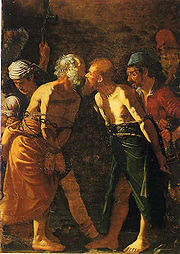 Peter and Paul giving each other the holy kiss before their martyrdom. (Alonzo Rodriguez, 16th century, Museo Regionale diMessina). Today as part of my ongoing posts from the application section of my 1 Thessalonians commentary I am looking at Paul’s command in 5:26. The request might strike modern, western readers as a bit odd. We are not accustomed to kissing everyone at church; such activity is normally restricted to a few people with whom we are close. But the exchange of a kiss seems to have been a natural expression between community members in the early church (Rom. 16:16; 1 Cor 16:20; 2 Cor 13:12; 1 Pet 5:14). There is even some evidence from the writings of Justin Martyr that the exchange of a kiss was a normal part of the Eucharist celebration. Having ended the prayers, we salute one another with a kiss. 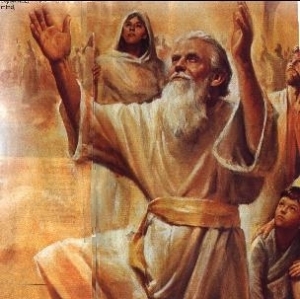 There is then brought to the president of the brethren bread and a cup of wine mixed with water; and he taking them, gives praise and glory to the Father of the universe, through the name of the Son and of the Holy Ghost, and offers thanks at considerable length for our being counted worthy to receive these things at His hands. And when he has concluded the prayers and thanksgivings, all the people present express their assent by saying Amen. (I Apol.65.2). While some people will be more comfortable with this expression than others, I don’t think we need to take Paul’s injunction here as a command that we kiss one another. His request here is no different than when we say to someone “say hi to Sally for me, and give Bob a hug.” Paul is merely communicating what was a culturally acceptable way of expressing friendship. What is significant, however, is how this action might have been observed by those outside of the community. Knowing that the Christian community often included people of various ethnic and social backgrounds, (Jew and Gentile, rich and Poor, slave and free), it would have been shocking to some to witness the blurring of social lines not only by joining together for worship, but also physically embracing and kissing each other. Such displays of Christian love would have been similar to those who crossed the color boundary under Jim Crow in the USA. What we can and should take away here is Christians having a visible, concrete way to express their love for one another. That may involve a hand shake, a hug, a kiss or even foot washing. I suggested that we may not need to follow Paul’s words exactly since kissing in western culture is not normally something one does outside of family circles and a few close friends. But I wonder if a handshake or a hug is enough? I noted above that the kiss would have the blurred the social lines in the Greco-Roman world and would have gotten the attention of non-Christians. What is it that we do today, as believers, which makes us stand out? I am not talking about stands we take on issues, the charity we promote or the causes we support. What physical expression of love do we practice as Christians with other Christians? I remember growing up in a church where it was the habit to “pass the peace” between the confession of sin and the beginning of the Eucharist. This seems to be a carryover of what Justin Martyr described as a normal part of the Eucharist celebration (I Apol. 65.2). What it looked like was a “break” in the service. For a few minutes everyone got out of their pew and greeted, shook hands with others and even took a brief moment to ask how someone was doing with a quick promise of “see you after the service.” It was like a mini fellowship session right in the middle. But it wasn’t always that way. For quite a while it was a dour occasion, people limply shaking hands, mumbling “peace” and maybe attempting a smile. Then one day we had someone who was excited about his faith and the chance to be in church. When it came time for passing the peace he would hug people, slap them on the back and show just how happy he was to be there. His greeting expressed his thanks to God and for the people in the church. It broke down barriers and anyone coming to the church as a visitor could not doubt that the people there loved each other. There is a hymn from the 1960s in which the refrain says: “And they'll know we are Christians By our love, by our love, Yes, they'll know we are Christians By our love.” We might ask ourselves “does our love for one another reflect that we are Christian?” I am not referring to the way display love through charity and helping others. But is there something that we do that helps other around us to look and say “those are Christians, I can see it by their love.” It was this way for the Thessalonians. In 4:9-10 Paul recounts that the Thessalonians were well-known for their brotherly love. It’s possible that the kiss they offered to those who entered their assembly, regardless of social standing, was one of the things that got others attention. In the Brethren tradition it is common to combine foot-washing and Eucharist together. Many will find this to be an uncomfortable exercise. But it can also be a humble, loving thing to do for a brother or sister. It’s hard to think more highly of ourselves when we are looking at someone else’s feet. Greeting with a kiss, hugging, washing feet or serving one another communion are different ways we can express love physically to our brothers and sisters. What expressions of love do you practice in your tradition that would clue others in that you are Christian? I have been posting some previews to Thessalonians commentary I am writing. Last week I posted on reading scripture publicly and praying continually. Today I am posting on Paul’s words in 1 Thessalonians 5:20-21. Paul exhorts the Thessalonians not to “quench the Spirit.” It’s possible that Paul is speaking about the actions of the Spirit in the things he mentioned in 5:16-18: rejoicing, prayer and giving thanks. But it is more likely that he is referring to those gifts commonly referred to as charismata, specifically prophecy. There seems to have been some in the church who were treating the exercise of prophecy as having little worth (5:20). Today, as then, believers don’t always see eye to eye on the necessity or practice of prophecy and other spiritual gifts. The difficulty with prophecy, of course, is that it’s not easy to argue with someone who says they are speaking from God. Since genuine prophecy is linked to the Spirit it is, by definition, outside of the control of the leadership. That does not nullify, however, Paul’s exhortation that both the leaders and the community admonish those whose expression of prophecy becomes disruptive or disorderly (5:12, 14; 1 Cor. 14:26-33). Prophecy was intended for the “common good” of the whole congregation (1 Cor. 12:7) and because of that Paul commands here that they “test them all.” This suggests the serious nature of prophecy since some expressions of it should be avoided. But it is also important to point out here that Paul does not say to reject the person speaking the prophecy. Since Paul assumes prophecy to be a normal expression of Christian worship he seems to also assume that sometimes people will get it wrong. When that happens it is time for the leaders who provide care for the community to step in and, if need be, bring correction to the brother or sister whose expression of prophecy is either disruptive or just plain wrong (5:12). One person in church history who embraced the gift of prophecy in worship was Tertullian. 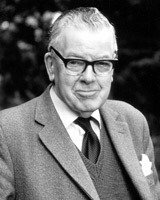 He was influenced by a charismatic movement known as Montanism. While the group was later considered to by heterodox, they were never formally labeled as “heretics.” What is interesting for our purposes is the way Tertullian describes how prophecy functioned in the meetings. Prophecy was still in operation in the church 200 years after the apostolic age and the parameters set down by Paul were still in force. All utterances were tested. One frustrating thing here is that Paul never tells us how to test a prophecy. What are the elements that clue us in that a prophecy is wrong? Certainly some would be obvious. If a prophet tells you to divorce your spouse or something else clearly not consistent with the teachings of Jesus and Scripture you would conclude, hopefully, that the person was prophesying incorrectly. But again, it’s hard to argue with someone who says they are speaking from God. While the Thessalonians may have understood what Paul meant here, other believers in the not too distant future would struggle with the same problem. In a late first early second century Christian document known as the Didache, we find an example of how some early Christians found a way to deal with false prophets. Here is what the Didache has to say. Now concerning the apostles and prophets, deal with them as follows in accordance with the rule of the gospel. Let every apostle who comes to you be welcomed as if he were the Lord. But he is not to stay more than one day unless there is need, in which case he may stay another. But if he stays three days, he is a false prophet. And when the apostle leaves, he is to take nothing but bread until he finds his next night’s lodging. But if he asks for money, he is a false prophet. Some of what is said here sounds a bit humorous to modern ears. I can’t imagine calling a visiting guest speaker a false prophet simply because they ask for something to eat or stay more than a couple of nights. The situation the Didache speaks to is certainly a specific one that doesn’t apply for all times and places. But there may be some insight we can gain here. The Didache doesn’t put emphasis on judging what a prophet says, but on what a prophet practices. As I noted above, it is hard to argue with someone who claims to be speaking from God. And if the Old Testament teaches us anything, it is that prophets can do and say some pretty bizarre things. But it seems fair to also conclude that anyone who is claiming to speak with authority for God should also be demonstrating the principles of the gospel in their life. So, one way that we might be able to judge prophecy today is to consider the source. If a person prophesying is living a life that is contrary to the teachings of Jesus, then we might decide that their prophecy is the kind that Paul tells the Thessalonians to reject (5:22). My colleague here at Ashland Seminary, David deSilva has a new book out. It is titled The Jewish Teachers of Jesus, James, and Jude: What Earliest Christianity Learned from the Apocrypha and Pseudepigrapha (Oxford). Here is a blurb. Jews have sometimes been reluctant to claim Jesus as one of their own; Christians have often been reluctant to acknowledge the degree to which Jesus' message and mission were at home amidst, and shaped by, the Judaism(s) of the Second Temple Period. 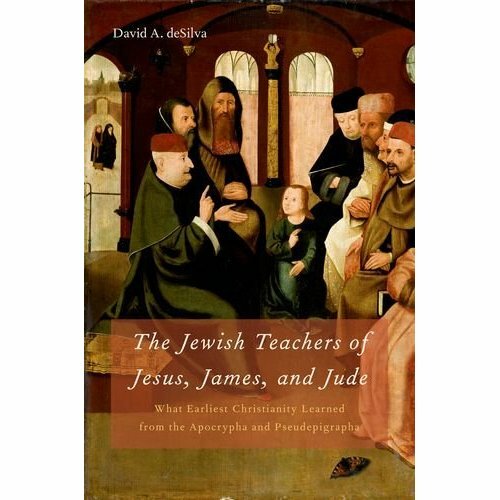 In The Jewish Teachers of Jesus, James, and Jude David deSilva introduces readers to the ancient Jewish writings known as the Apocrypha and Pseudepigrapha and examines their formative impact on the teachings and mission of Jesus and his half-brothers, James and Jude. Knowledge of this literature, deSilva argues, helps to bridge the perceived gap between Jesus and Judaism when Judaism is understood only in terms of the Hebrew Bible (or ''Old Testament''), and not as a living, growing body of faith and practice. Where our understanding of early Judaism is limited to the religion reflected in the Hebrew Bible, Jesus will appear more as an outsider speaking ''against'' Judaism and introducing more that is novel. Where our understanding of early Judaism is also informed by the Apocrypha and Pseudepigrapha, we will see Jesus and his half-brothers speaking and interacting more fully within Judaism. By engaging critical issues in this comparative study, deSilva produces a portrait of Jesus that is fully at home in Roman Judea and Galilee, and perhaps an explanation for why these extra-biblical Jewish texts continued to be preserved in Christian circles. I look forward to reading it. Many thanks to David for a complimentary copy.